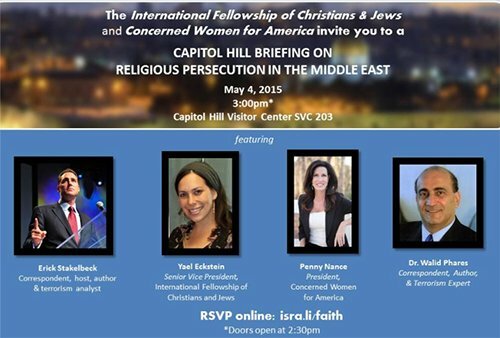 Washington, D.C. – Concerned Women for America and the International Fellowship of Christians and Jews would like to announce their upcoming panel discussion on religious persecution in the Middle East. Erick Stakelbeck, terrorism analyst, host, and author, will be moderating the panel featuring Penny Nance, CEO and President of Concerned Women for America; Yael Eckstein, Senior Vice President of the International Fellowship of Christians and Jews, and Dr. Walid Phares, author and terrorism expert. Two weeks ago, Penny was in Israel with Yael to see firsthand how the Israeli people are handling anti-Semitism and religious persecution. “It was an honor to travel to Israel with the International Fellowship of Christians and Jews (IFCJ) to focus on religious freedom for Christians and Jews. Yael Eckstein guided me through IFCJ’s current humanitarian projects, including how they provide food, clothing, shelter, housing, and other needs to those in Israel. I visited with the Knesset, the Mayor of Efrat, and a commander of the Israel Navy Base. Media are invited to attend. For interviews with panelists, please contact Alexandria Paolozzi at 202-420-1537 or [email protected]. Concerned Women for America Legislative Action Committee is the legislative arm of Concerned Women for America, the nation’s largest public policy women’s organization with 500,000 participating members across the country, over 450 Prayer/Action Chapters and Home Teams, 600 trained leaders, and over 35 years of service to our nation. For more information visit www.concernedwomen.org.